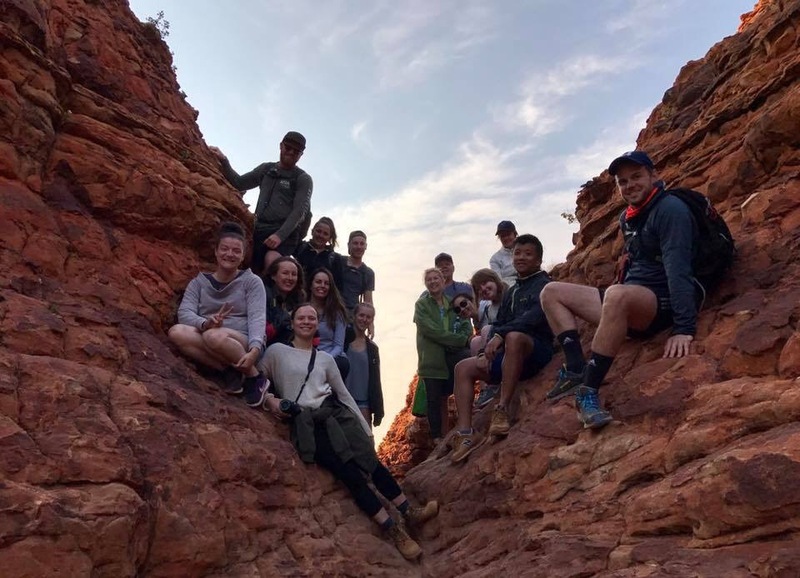 After a couple of days relaxing and doing very little in Alice Springs, we were up bright and early for a 5am pickup on Friday 15th September 2017 to start our three day, two night tour of the Red Centre. 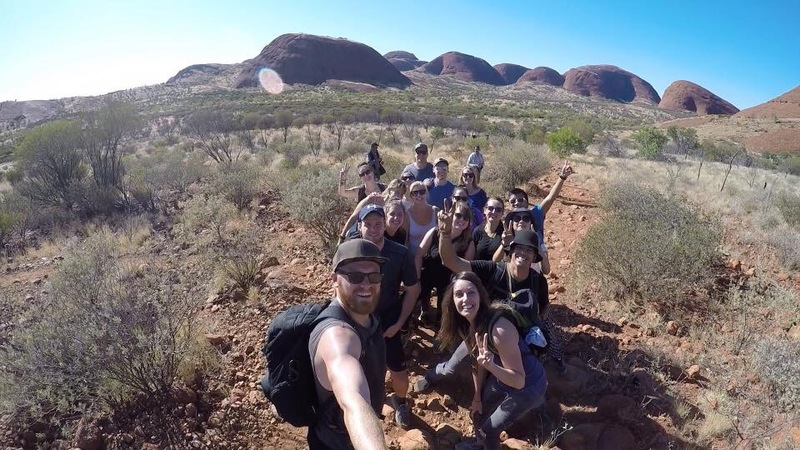 This was with a company called Mulga’s and our guide, Mark, was going to take us to the main sights such as Uluru (Ayer’s Rock), Kata Tjuta and King’s Canyon. 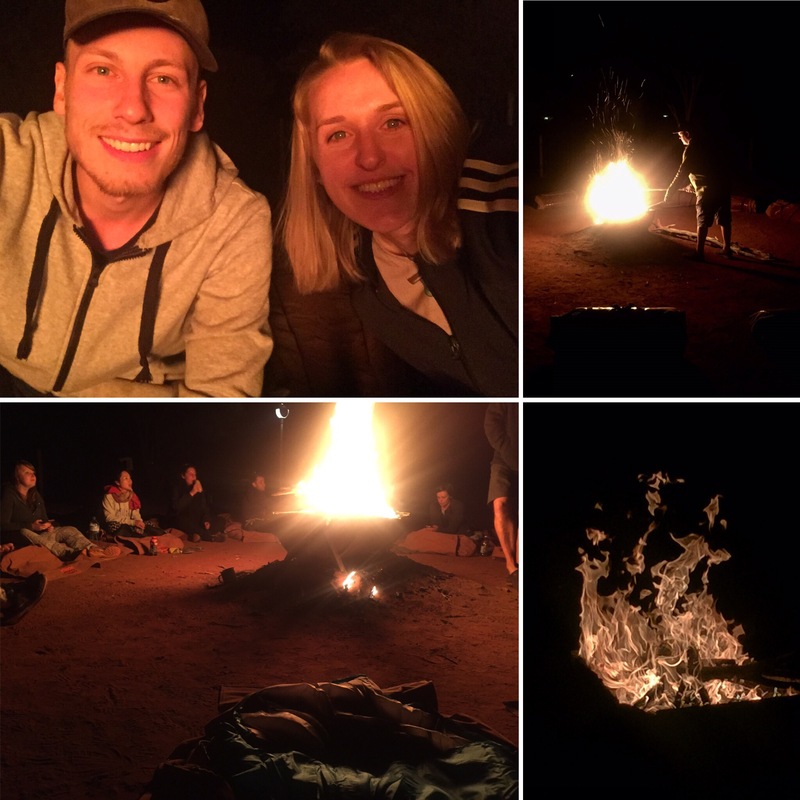 We would be camping under the stars and learning a lot about aboriginal culture – I couldn’t wait to see it all! 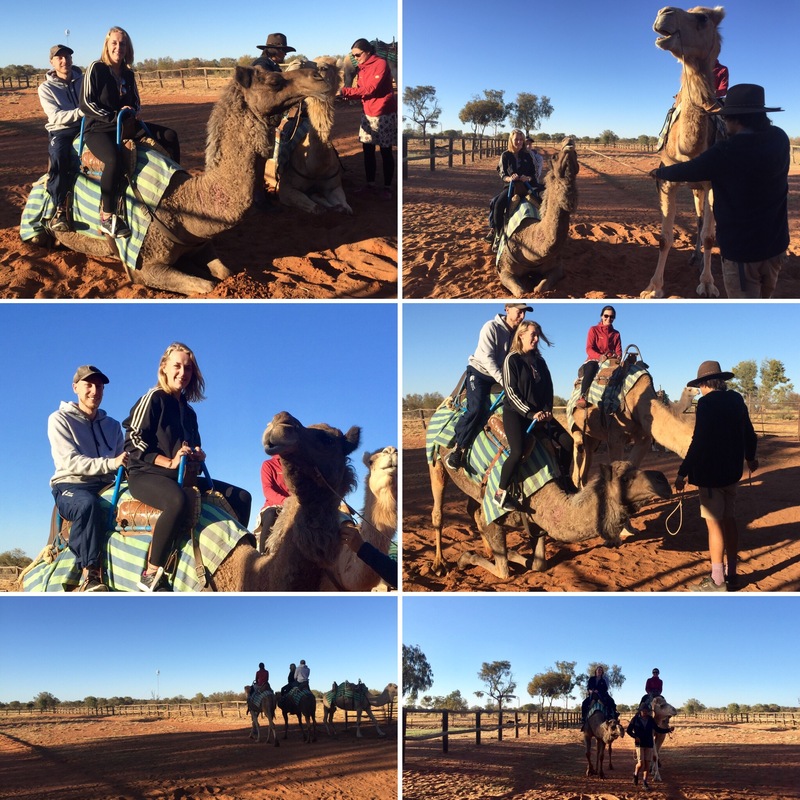 Our first stop was to ride camels which we thought was very random. 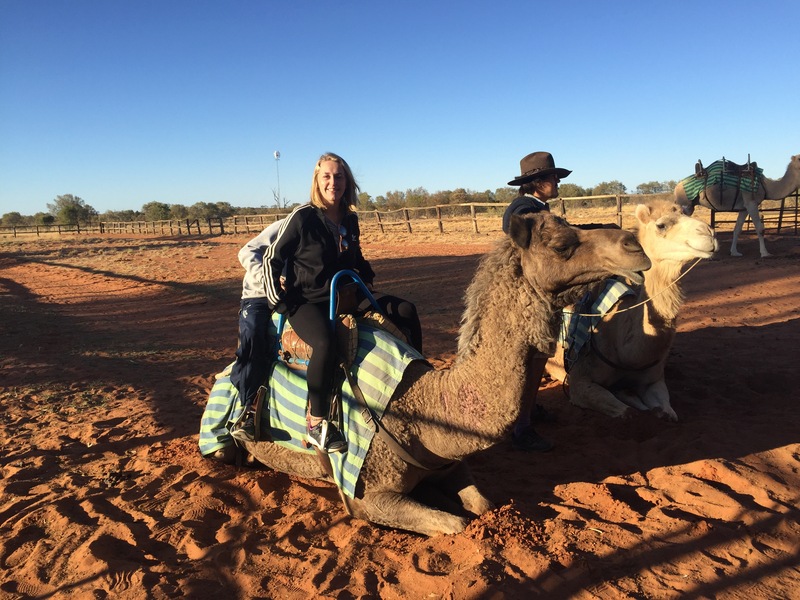 It actually turns out that Australia has the biggest wild population of camels in the world and they’re the biggest exporters of camels (who knew?!) so maybe it wasn’t as random as we had thought. The camels were so tall and our one, Hally, really didn’t want to be riding anyone around so always took ages to get up once you got on. The camel handler told us she’s the most sassy of all the camels and you could really see why. 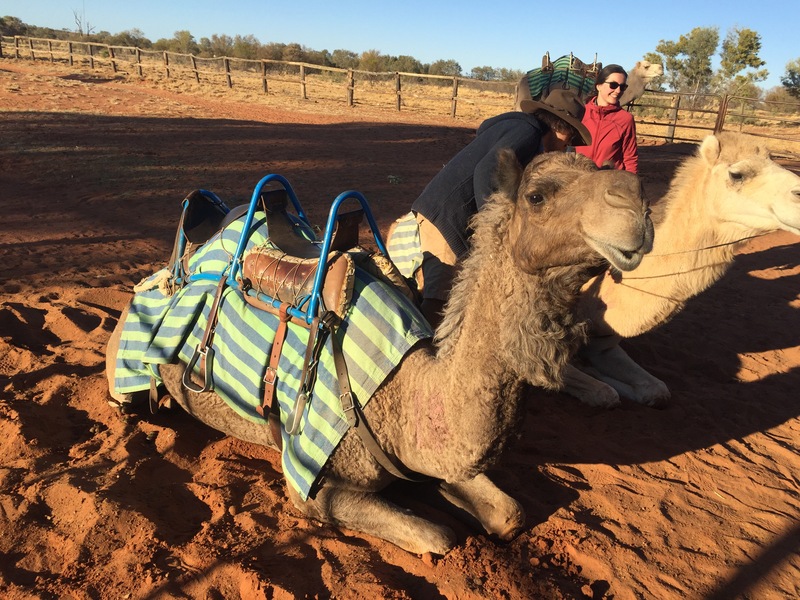 We rode around a paddock and the camels ran at the end which has you bouncing all over the place – not particularly comfortable for Niall! It was a good laugh and I think it definitely woke everyone up! After a few stop offs at service stations (or road houses) we arrived at camp. Yulara was where we would be sleeping that night and this was our gateway to Uluru. 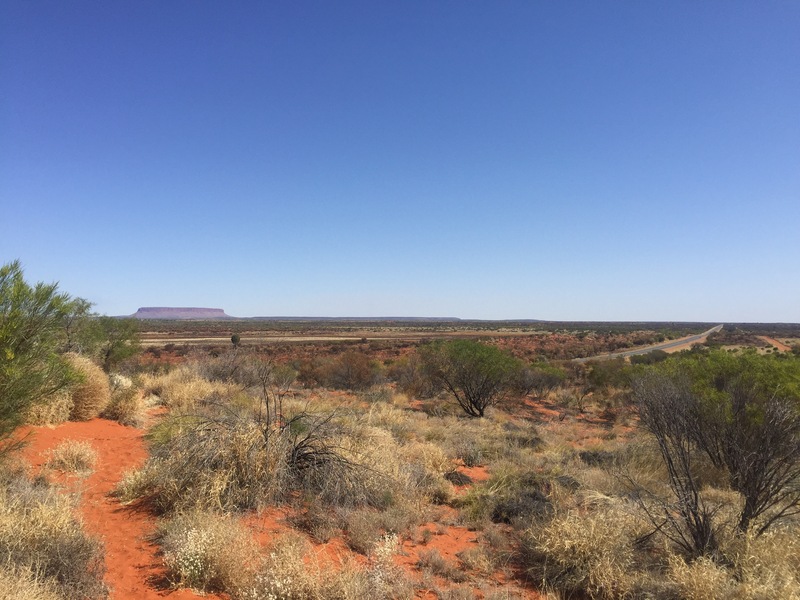 Mark had made the long drive from Alice a breeze by showing us enormous wild eagles that we passed on our journey and getting us involved in collecting the fire wood for that night’s camp. 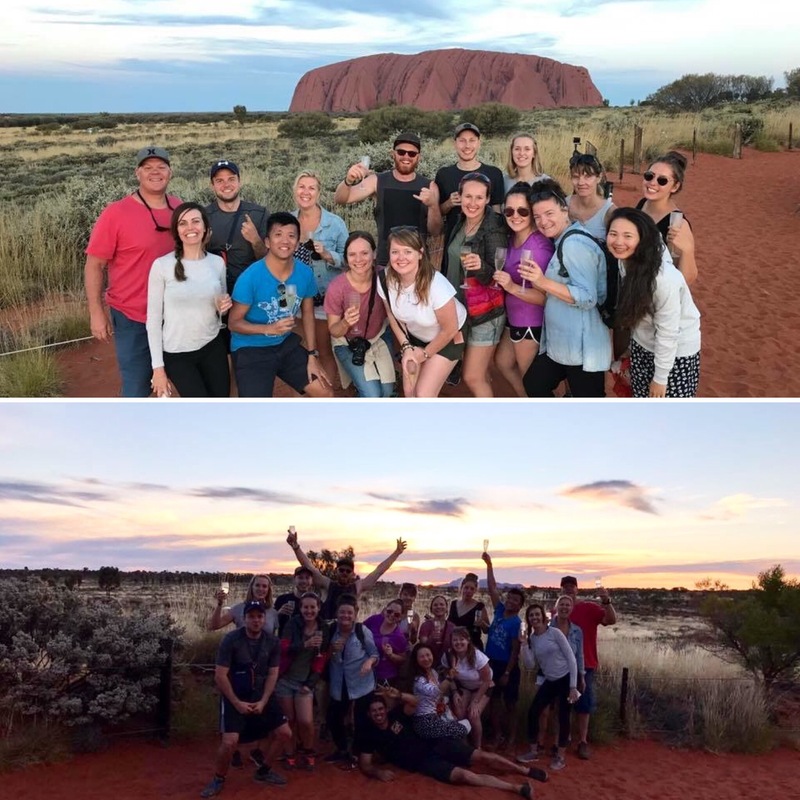 There was 16 of us on our tour and we had already all started to get along and, after a good lunch, it was shaping up to be a good rest of the day at Uluru! After lunch, we drove the winding roads past the giant orange rock that is Uluru. I was surprised by how it wasn’t as rounded and uniform as it appears in pictures I have seen but instead it’s a kind of a wavy shape with ridges and dips all the way along it. 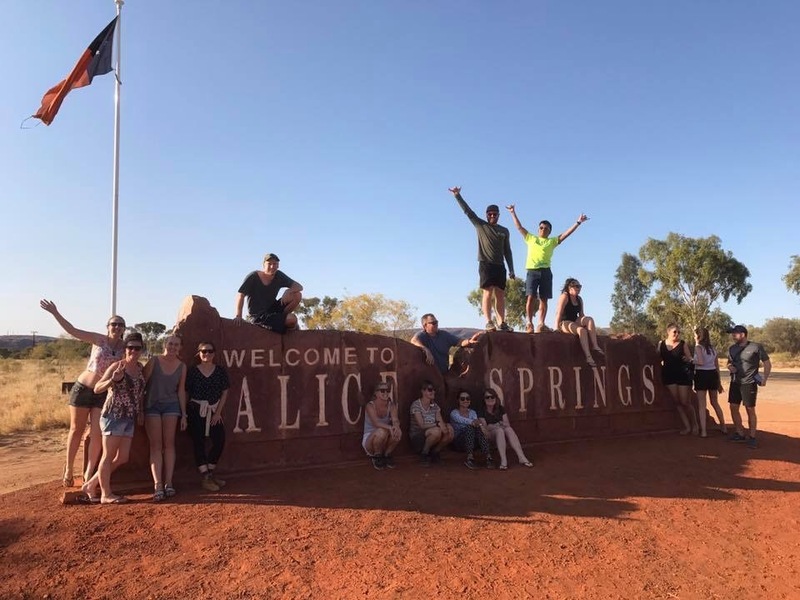 Our first stop was to the cultural centre where we read stories about how the aboriginals believe Uluru was formed and the aboriginal culture in the area. I watched a video of when aboriginals met ‘white people’ for the first time. The ‘white people’ came in on camels and in the video a man shouts “that animal has folded itself up!” describing the camel bending its legs and sitting down. I think it’s fascinating to see a culture being exposed to another with fresh eyes – something we never really experience anymore now that google is always at our fingertips. The ‘white people’ were farmers in the area and would trade food with the aboriginals in exchange for them hunting dingoes. Local farmers were having trouble with dingoes killing their livestock and the aboriginals were much better at hunting than themselves. 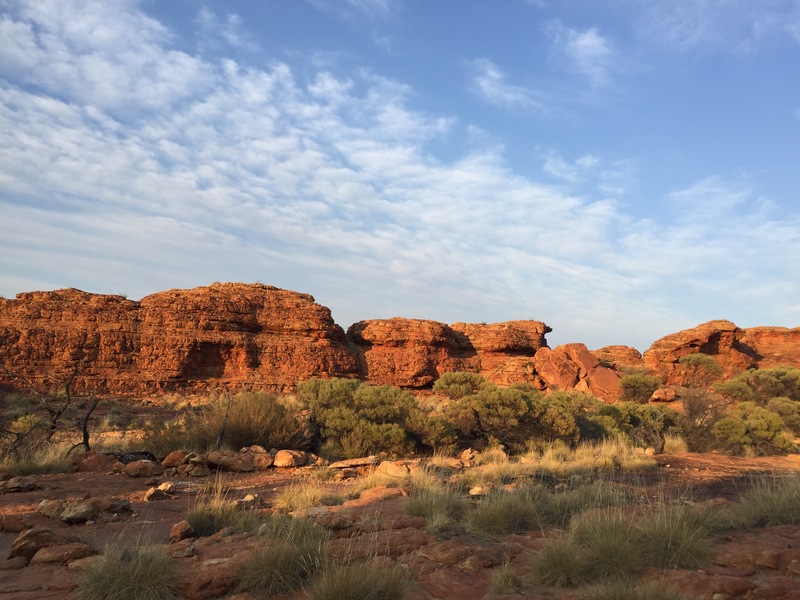 Unfortunately, the food being traded was considerably higher in sugars and fats than the typical aboriginal diet and this has led to a range of health problems including diabetes throughout aboriginal communities. 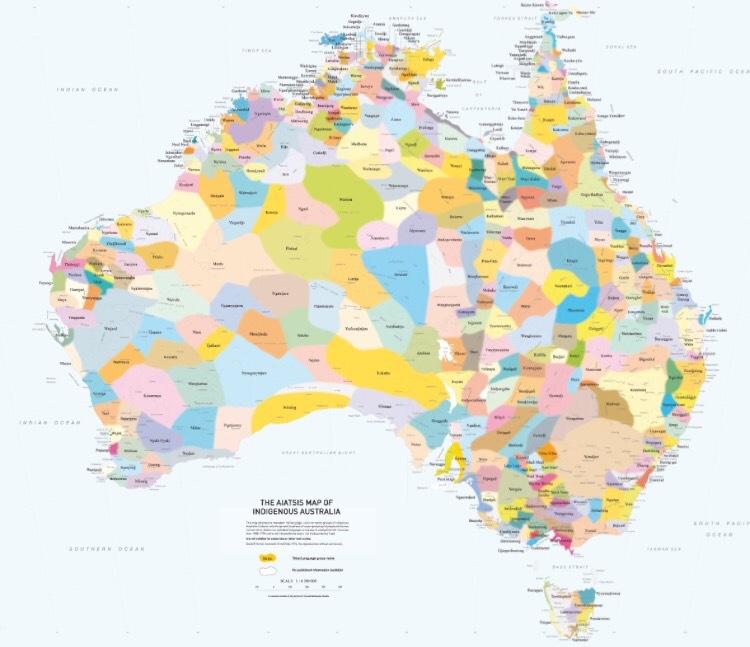 Aboriginals do not see the states of Australia as you would see on a map today. 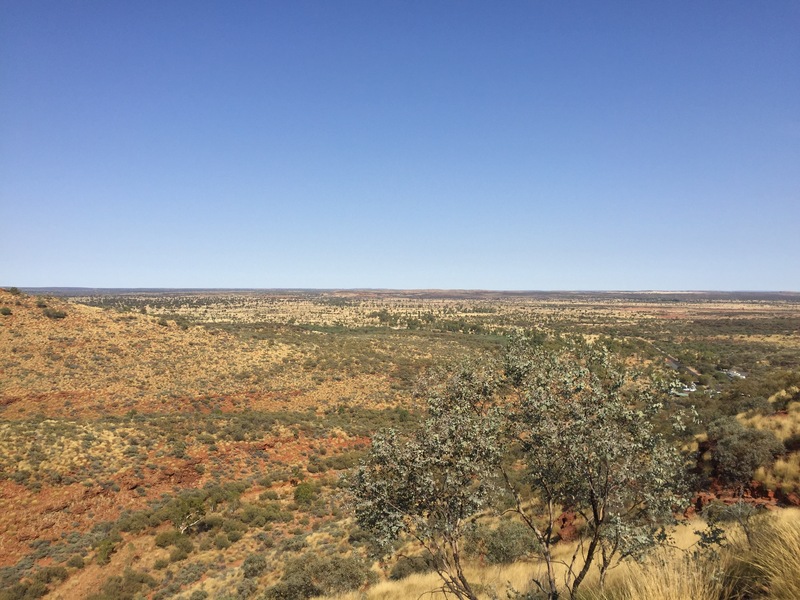 Instead the land is made up of a large number of countries covering every inch of Australia and lived on by a huge number of different aboriginal communities. Originally, Australia was made up of over 200 different countries that all housed different aboriginal groups – there was over 700 dialects at this time! 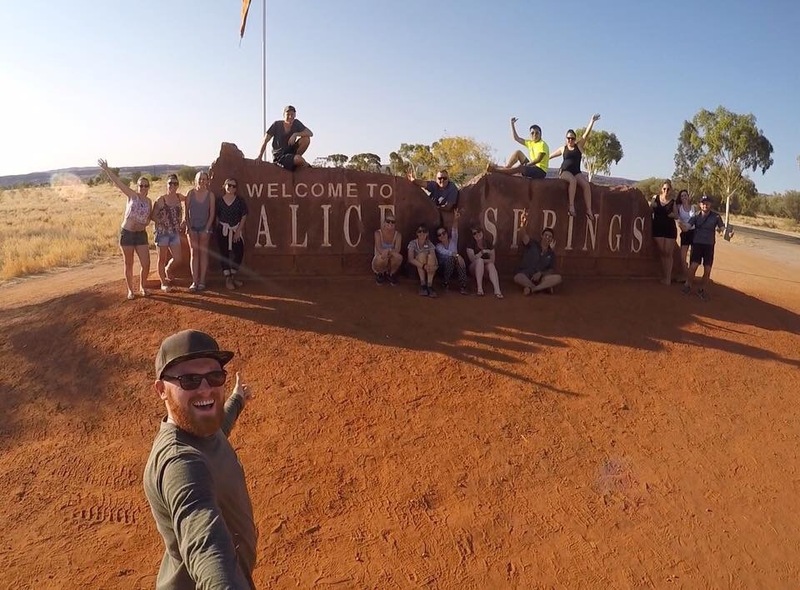 Now, due to the invasion of ‘the white man’, there is probably only 30-50 healthy countries left in Australia, with the Red Centre housing a large number of them – you even hear aboriginals speaking their own dialect in Alice Springs which is amazing to see them keep their heritage alive. 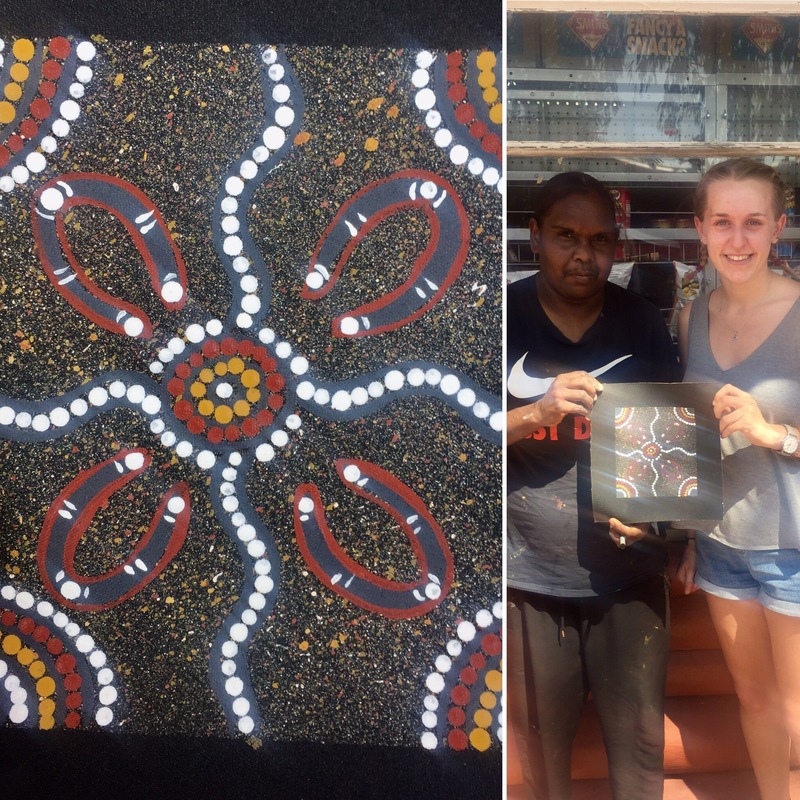 Australia have now adopted a new wave of tourism which focusses on promoting the understanding and respect of aboriginal culture. This new approach means that guides, like Mark from Mulga’s, are only allowed to teach things that come out of the Charles Darwin University that have been determined by the aboriginals as what is true in their culture. This makes sure that their beliefs are respected and are upheld and passed on as accurately and traditionally as possible. 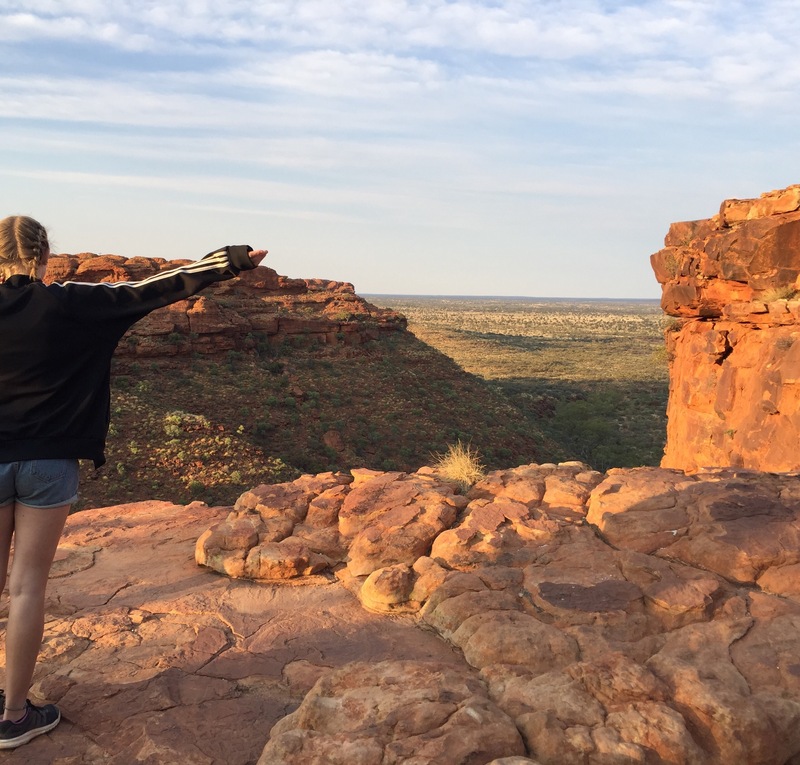 Guides also aren’t allowed to teach in certain areas such as the cultural centre, so that the knowledge passed on comes directly from the aboriginal culture and history. 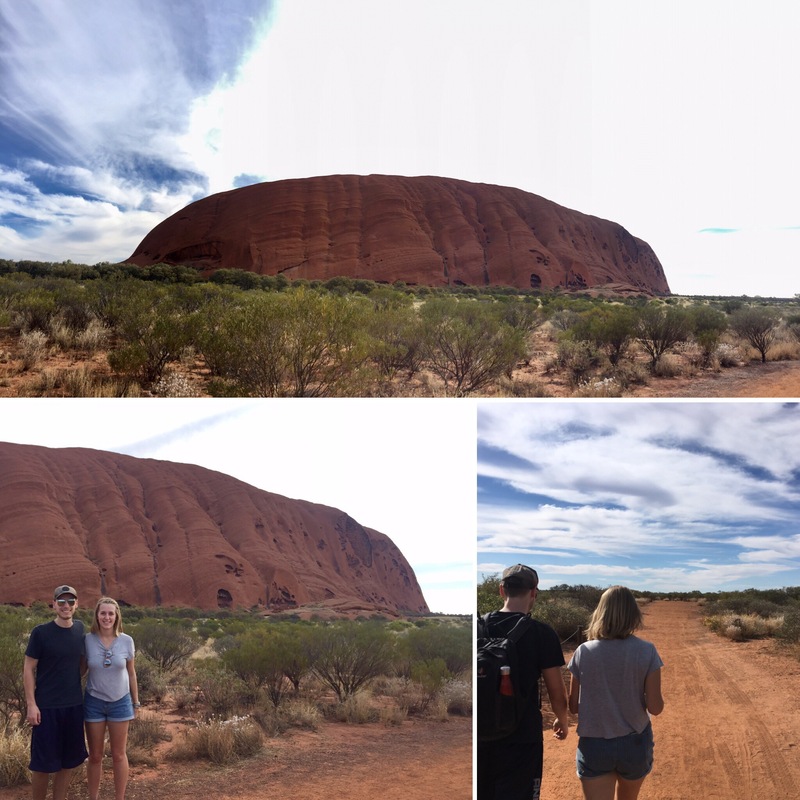 Once we began our walk around the base of Uluru, Mark pointed out the areas of the rock that linked to particular creation stories that we had read about within the cultural centre – this really helped to see the areas the stories had been describing and picture the scene a lot better. 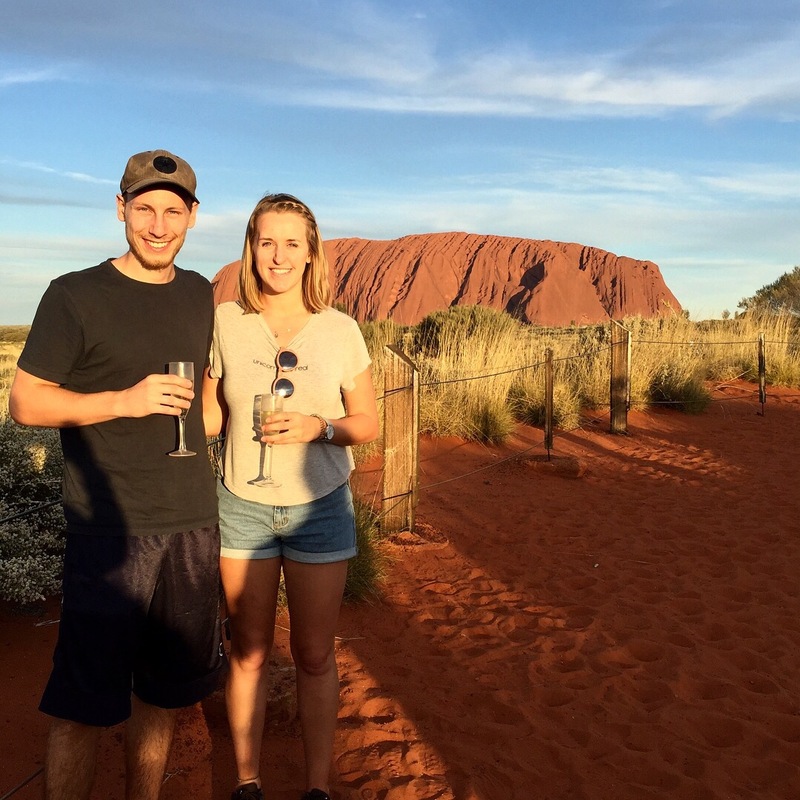 We were told about a giant python called Kuniya who came to Uluru as she sensed trouble in the area – you can see her movements over Uluru in the form of waved grooves in the rock. Her nephew had caused some trouble in a neighbouring country and was being chased and attacked by the Liru which were lizard warriors – you can see the holes in the rock left by spears that missed their target. It is custom that a warrior who punishes another must then remain with the one they have punished to nurse them back to help and look after them (as they could die if left alone injured). The Liru warrior who punished Kuniya’s nephew was not performing his duty to look after him and so Kuniya challenged the Lira after asking repeatedly why he was not performing his duty. The Liru had told her to not get involved in what didn’t concern her and so, after warning him three times and showing her readiness to fight, she struck him. The first two blows weren’t lethal but the final blow cracked the Liru in the head and killed him – you can see the crack in the rock where she struck the Liru. The message they took from this creation story was to follow tradition but also to not get in the way of a mother and her children! We learned that in aboriginal culture, mother and children take on a broader meaning and that this would not always apply directly to a parent and their child. The aboriginal culture is thought to be 70,000 years old which means they have lived through two ice ages and are the oldest known human civilisation! There was some cave artwork throughout the site which was believed to be as old as 5000 years old. 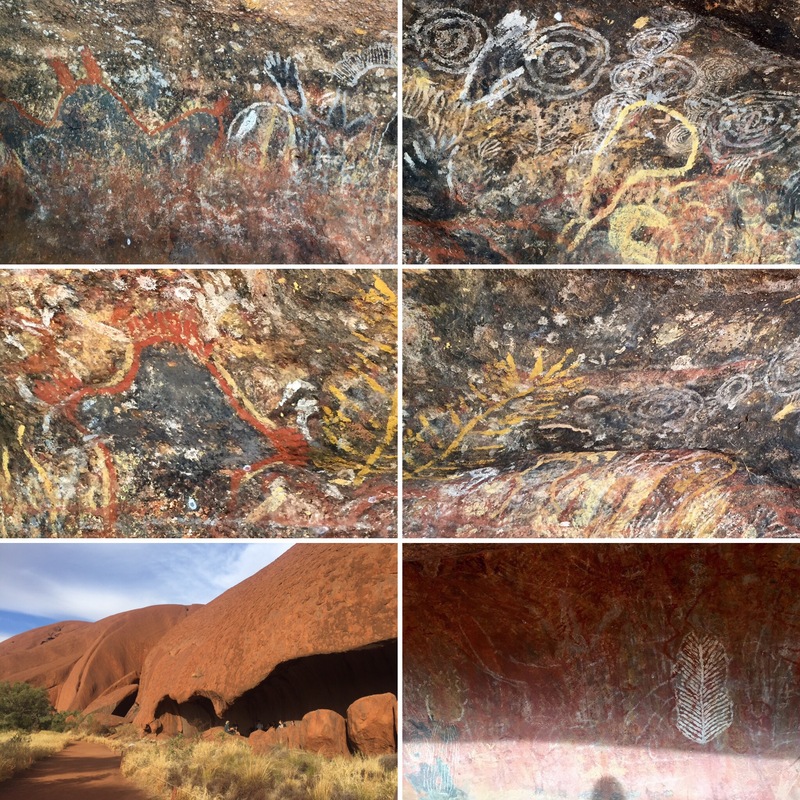 Artwork was drawn over and on top of one another as Uluru was a teaching ground for the people in the area and so they would use these areas to practice skills or be taught lessons. It’s incredible to think of the life the aboriginals lived being untouched and unchanged for thousands or years before any other civilisation even existed! 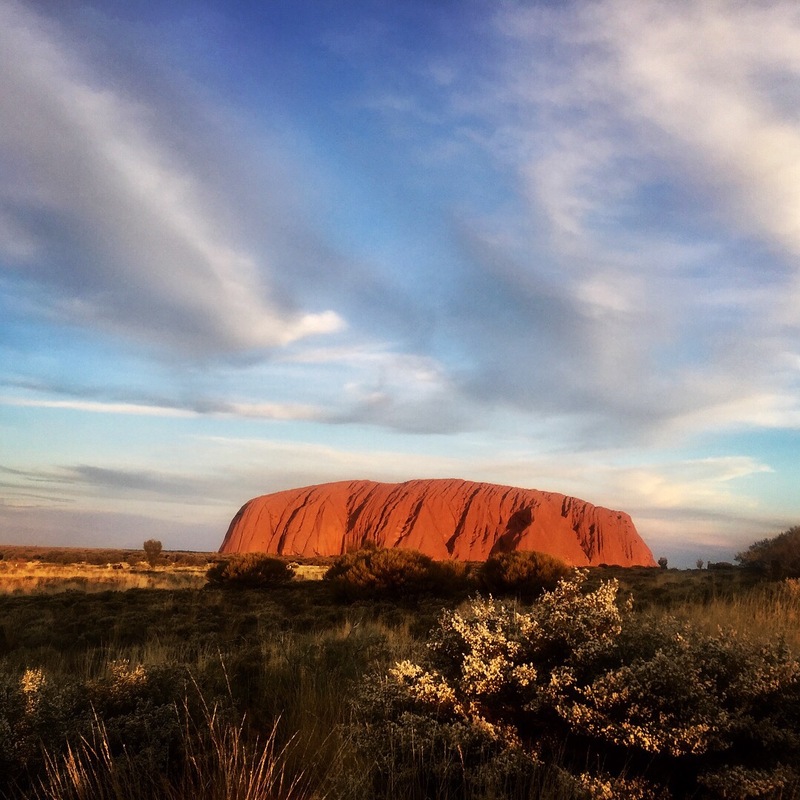 Uluru is one of the biggest rocks in the world and it is slowly peeling as the rock contracts and expands. The orange colour on its outside is actually from the rock oxidising and the actual colour of the rock is a normal rocky grey. It’s amazing to be able to go so close and even touch the rock and it’s incredible that it’s all one giant, natural structure. There were some areas that are still very sacred to the Aboriginals and so we weren’t allowed to go near them. The path we took around the base would move further out so as to keep distance from these areas and we would be asked not to take any pictures by signs stationed along the walk in those spots. The reason behind this is that viewing and learning the lessons from those areas has to be earned in aboriginal culture. This means that taking a photo of the area would take away from the significance of going there if they could be viewed in other places instead of only by making that specific journey – a very logical reason and one we made sure to respect. Again, I love that this ancient culture is still so heavily protected and practised today. 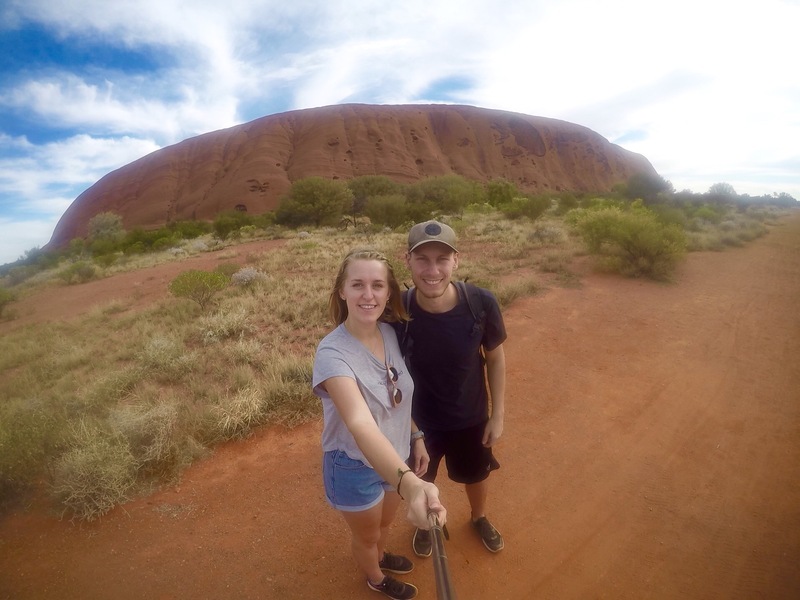 We did a two and a half hour walk around Uluru which was really good. 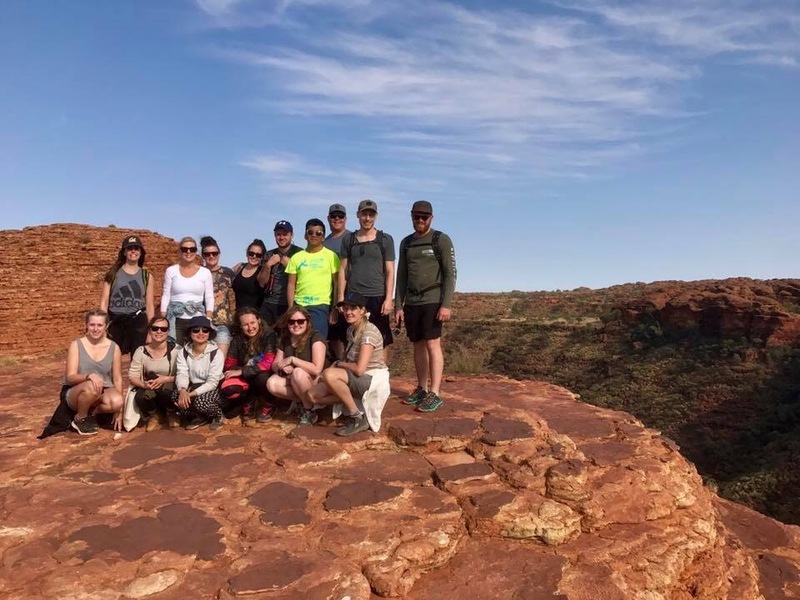 The walk itself wasn’t challenging as it’s relatively flat and you can to see the vastness of Uluru from every angle which is really impressive – I never knew it would be as big as it was! 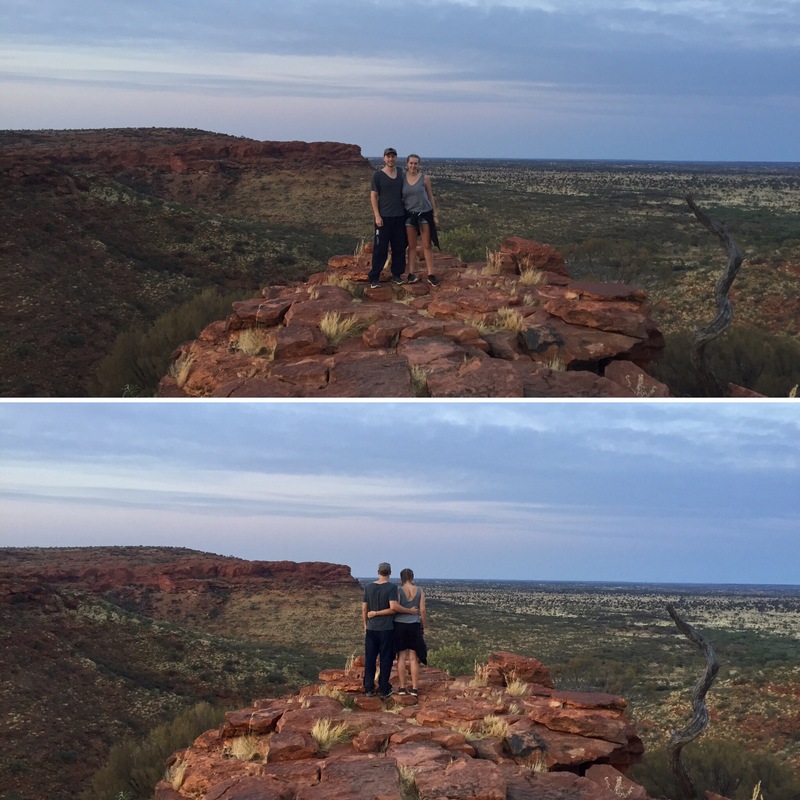 For sunset, we were taken to a good viewpoint of the rock, inbetween Uluru and Kata Tjuta (where we would be going in the morning) and given a glass of champagne and some nibbles of crackers and dip (these were devoured by us all). 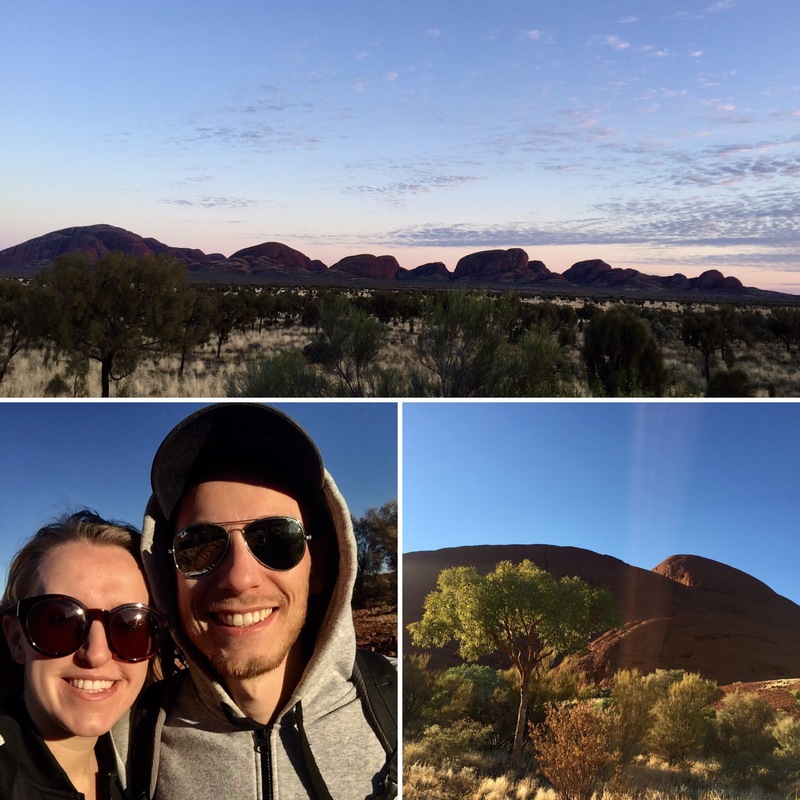 We saw the rock change to bright orange as the sun set and then saw the sky explode in an array of oranges and reds over Kata Tjuta – it was truly breathtaking. Uluru itself was incredible with a gorgeous pink sky creeping over towards it – I could look at it for hours and not get bored at how spectacular it is. Back at camp, we ate as much food as we could, got the fire going and then Mark helped us to get to know each other on the tour by everyone telling everyone else where we had been on our travels and what our plans were. 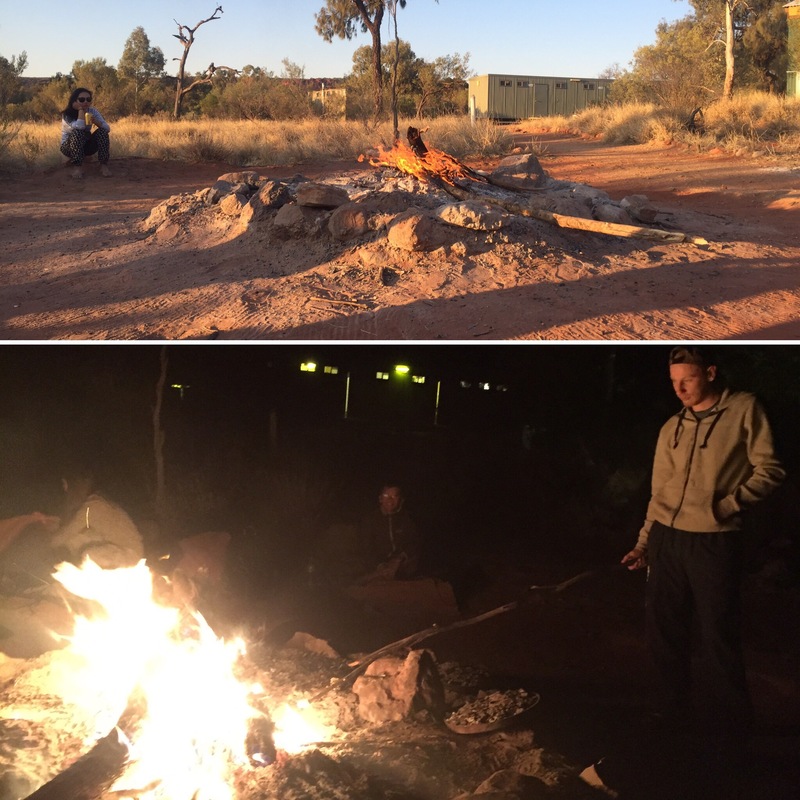 Our camp was outside that night – I think it’s amazing to be able to say I’ve slept out under the stars, around a fire in the outback! We slept in swags which are kind of like a waterproof cover with a small padded mattress in it that you then put your sleeping bag into. They’re actually surprisingly comfy. We all had marshmallows and Tim Tams (an Australian biscuit- like a penguin from the UK) around the fire and then got ready for bed. It was incredible looking out at the stars and I saw my second ever shooting star! We got up at 4:30am whilst it was still very dark. 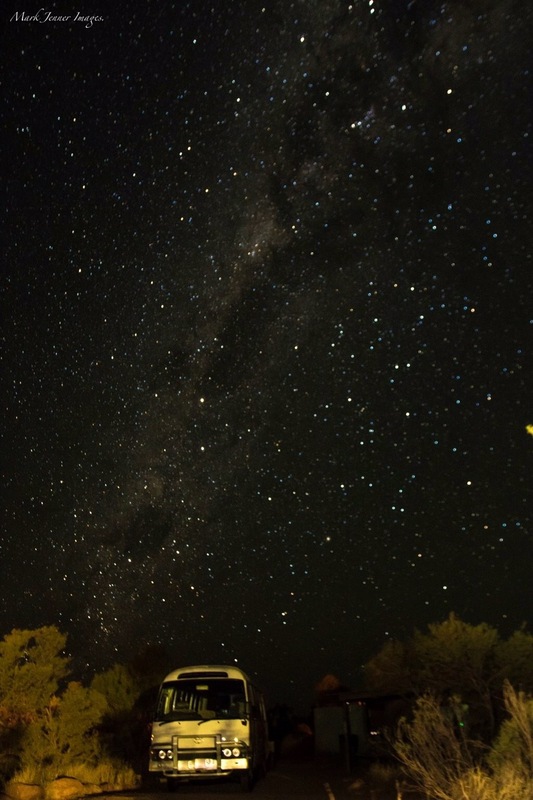 I had a broken sleep but it was always waking up to see a sky full of stars and complete silence from the campsite. 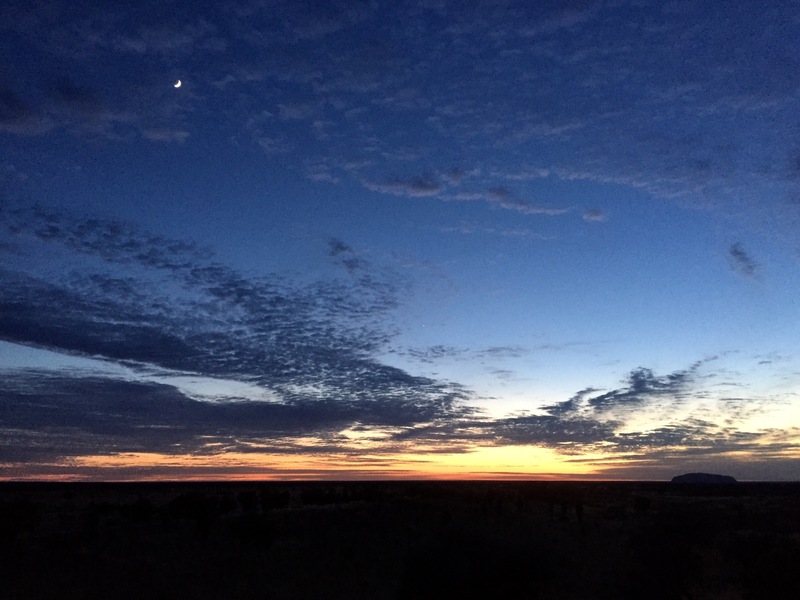 We were up so early to see the sunrise over Uluru before heading to Kata Tjuta to do a walk called the Valley of the Winds before the masses of tour busses swamped the place. 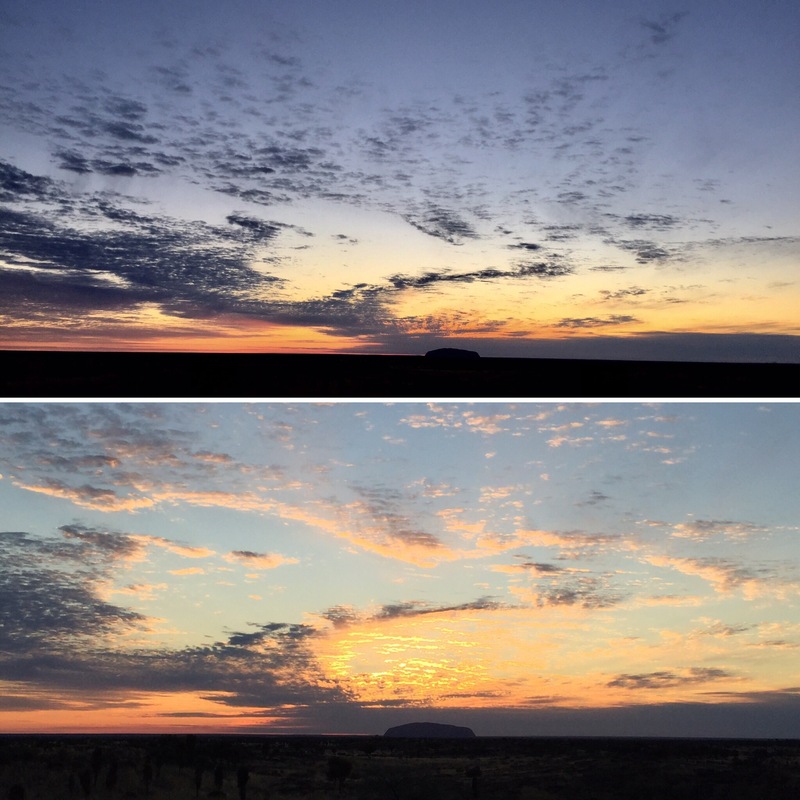 We took sleeping bags to the lookout to keep warm and watched the sunrise behind the spectacular Uluru. There was a big cloud directly behind it which was unfortunate but it was still a beautiful sunrise. 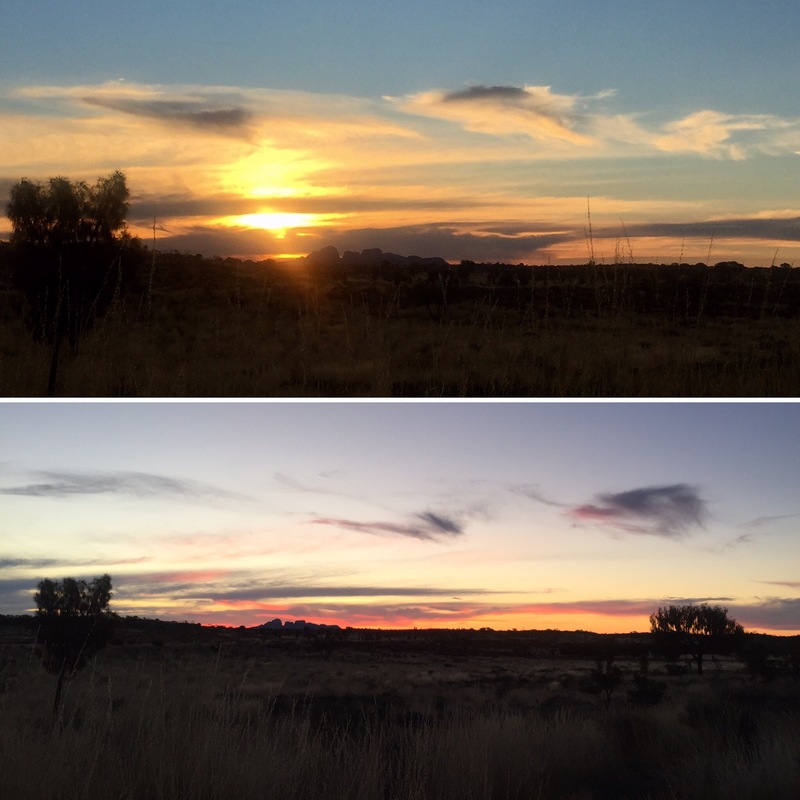 Since we watched the sunrise near to Kata Tjuta we were able to get into the valley fairly quickly. The name means ‘heads many’ and there are around 30 domes in total. The place was so vast and really was incredible to walk through. We had to climb over rocks and some of the ground was really uneven but it’s manageable and definitely worth it. I was surprised about the amount of foliage that was in the valley and Mark told us that in the past there was a big watering hole there. The whole area is very sacred for aboriginal men so maybe they used to come here to teach hunting to the younger boys (it’s a site that has no teachings sanctioned by the aboriginals so Mark couldn’t tell us things about it). There was eucalyptus, a type of mint and loads of lemongrass in the valley – Mark would point them out to us as we walked through. 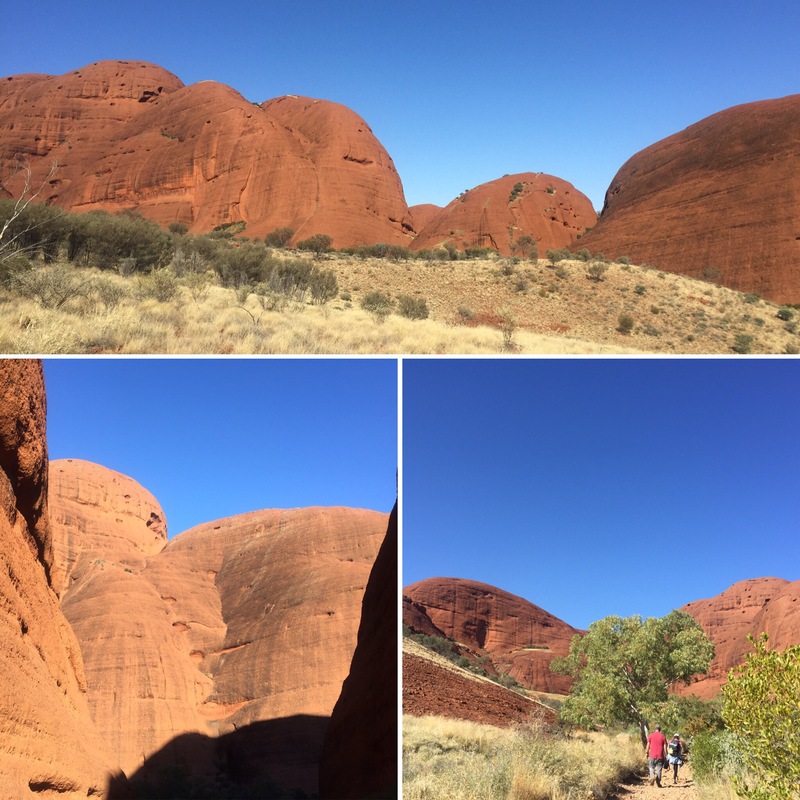 Once we got through the valley of Kata Tjuta, we walked through a much more open area that still had a number of domes in it. This area reminded us more of the African Savannah over the Australian outback – we expected to see a giraffe walk past at any moment! The view was just stunning and we were all awestruck by it! 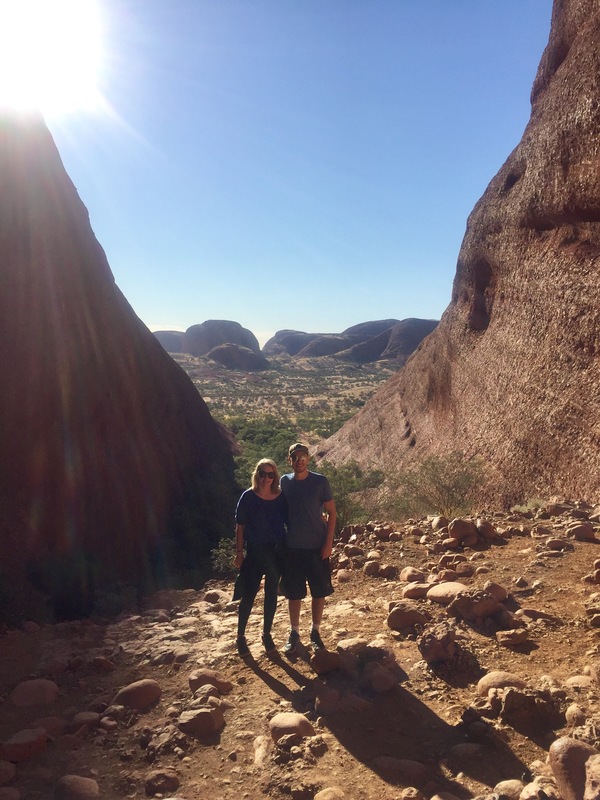 This was another incredible place to be and is worth the walk through it just to marvel at the giant orange domes that make up this sacred aboriginal spot. After lunch (camel burgers and veggie burgers – the camel burger was good, I tried a bit of it), we stopped to view Mount Connor which is often referred to as Fooluru as many people make the mistake of seeing Mount Connor and thinking that it’s Uluru, as it looks similar, so turn round before they even see the real Uluru. You aren’t able to get close to Mount Connor as the owners of the land have had issues with their families graves (that are buried nearby) being damaged. 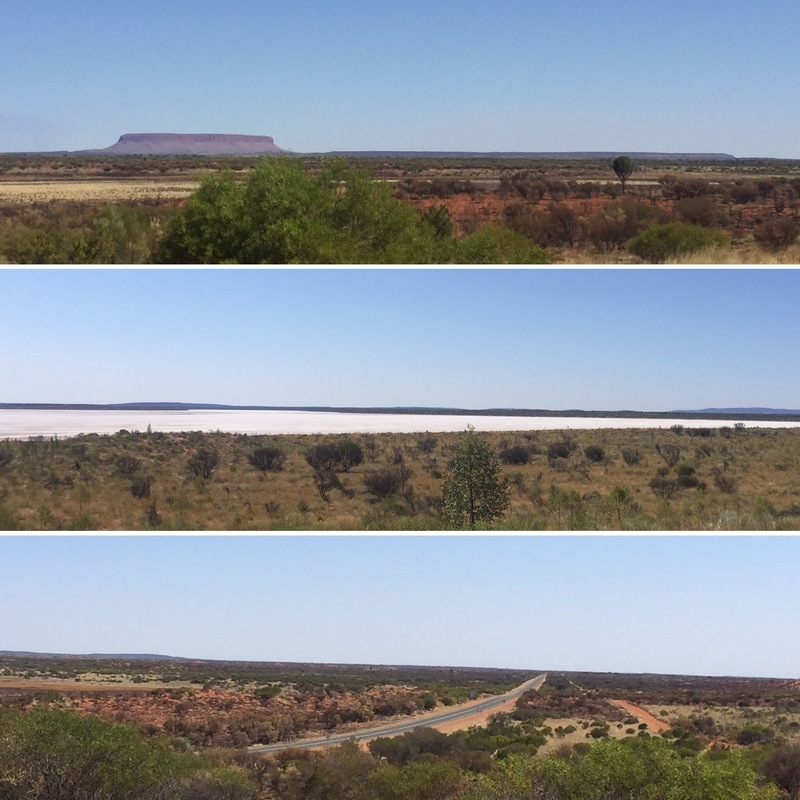 Across from Mount Connor is a giant salt lake which is part of the Amadeus Basin and was a brilliant white. Mark said that it isn’t the same as the salt lakes of South America as it isn’t hard enough to walk on but that we were lucky to see it so white as it can look quite muddy if there has been any rain. We were staying at a new camp nearer to our stop for tomorrow, Kings Canyon. We had collected fire wood and would be spending another night out under the stars. 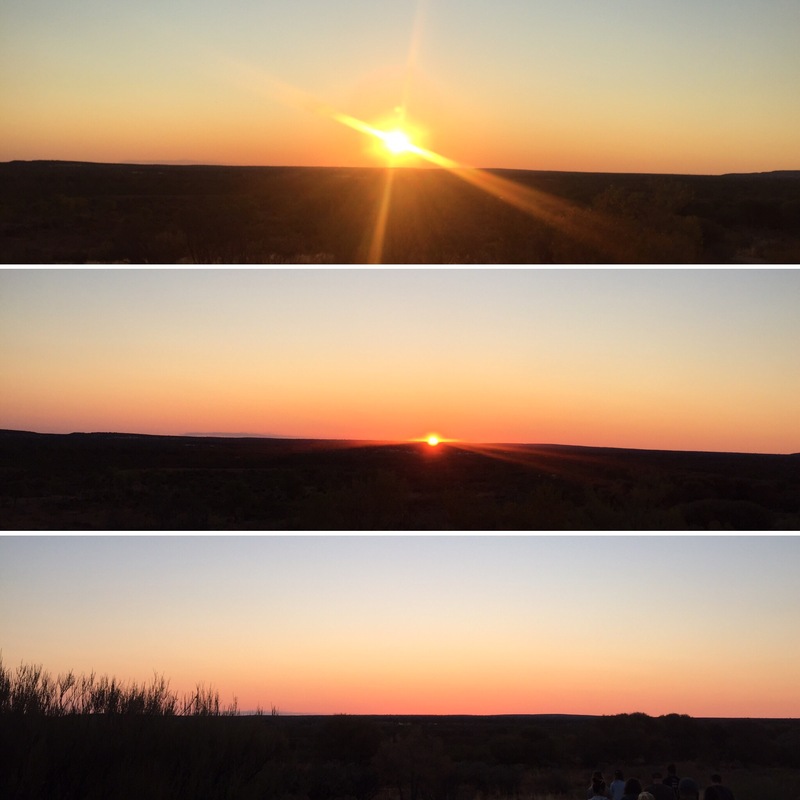 Our campground had a big firepit and we got to watch a very clear, colourful sunset from the top of the campsite. After the sun went down, we had an amazing tea from Mark. He made Dampah which is traditional bread that used to be made by the aboriginals and is cooked in a fire as well as sausages and kangaroo. Everyone loved all the food! 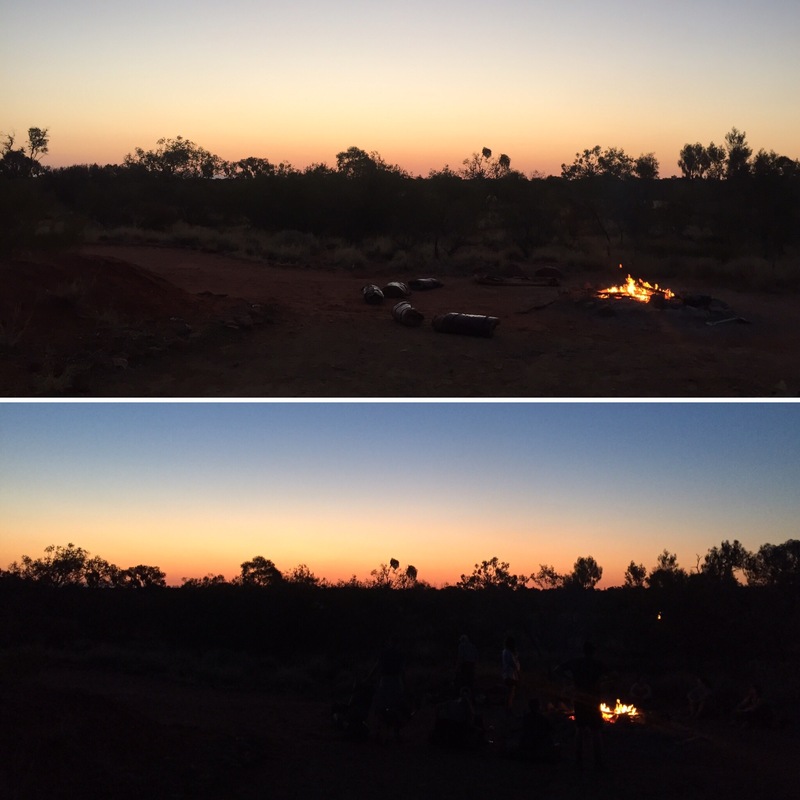 We roasted marshmallows around the fire and Mark took us to a darker part of the camp to talk to us about the stars – the sky was full of them! It has been amazing to see them so clearly both the nights we’ve been out here. It was a lot warmer in camp that night which made it easier to fall asleep (and getting up at 4:30am probably helped a bit). We were up again at 4:30am and had pancakes for breakfast which helped everyone get up as it was a lot harder than the day before. 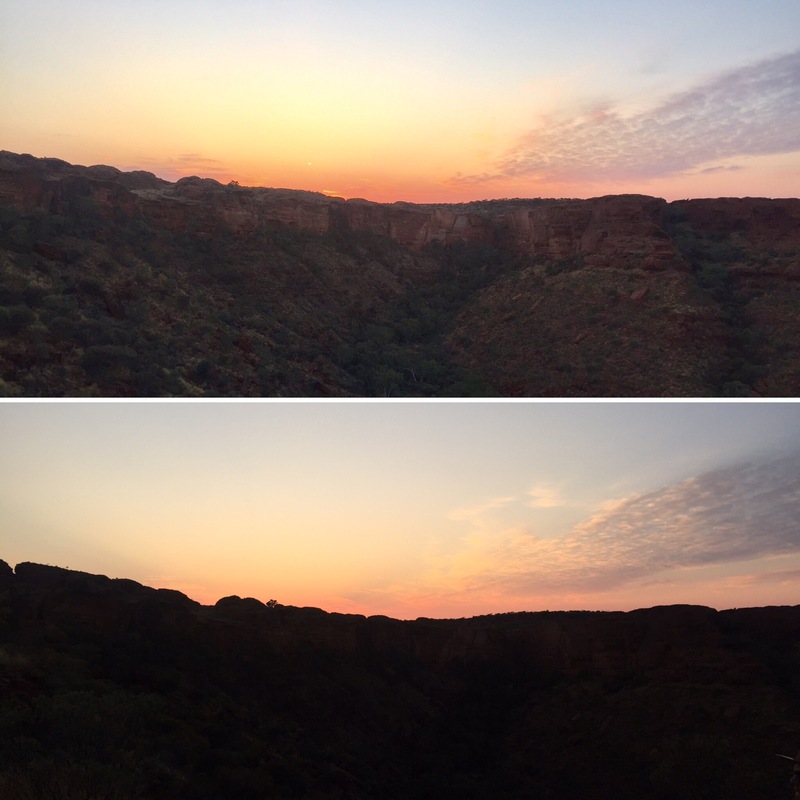 We were up early to see another sunrise and climb King’s Canyon. 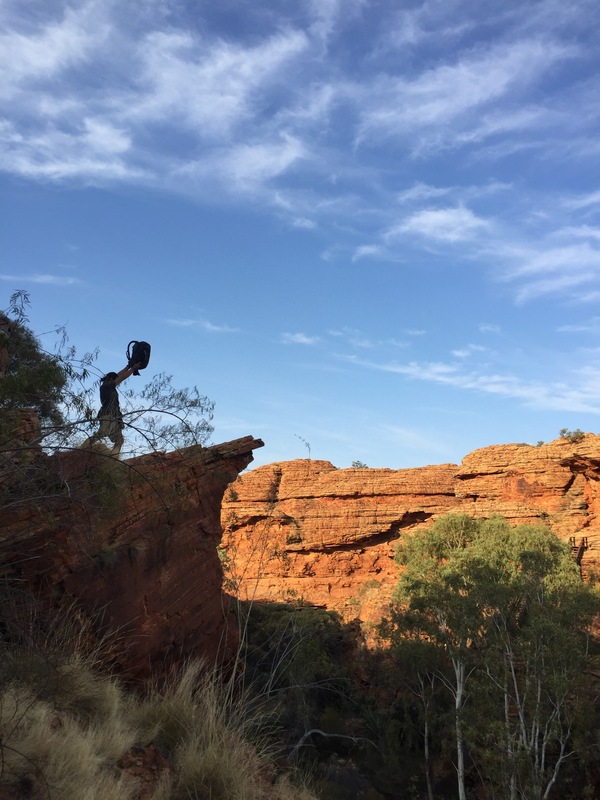 King’s Canyon is part of the Watarrka National Park and is an incredible landscape of red rock lining a huge canyon and looking out over miles of dessert. The climb up to the top of the canyon was pretty steep but once you got to the top it was relatively flat and SO worth it. For the rest of the morning (we got there around 6:30am) we explored the amazing canyon and I honestly can’t describe how incredible the place was. 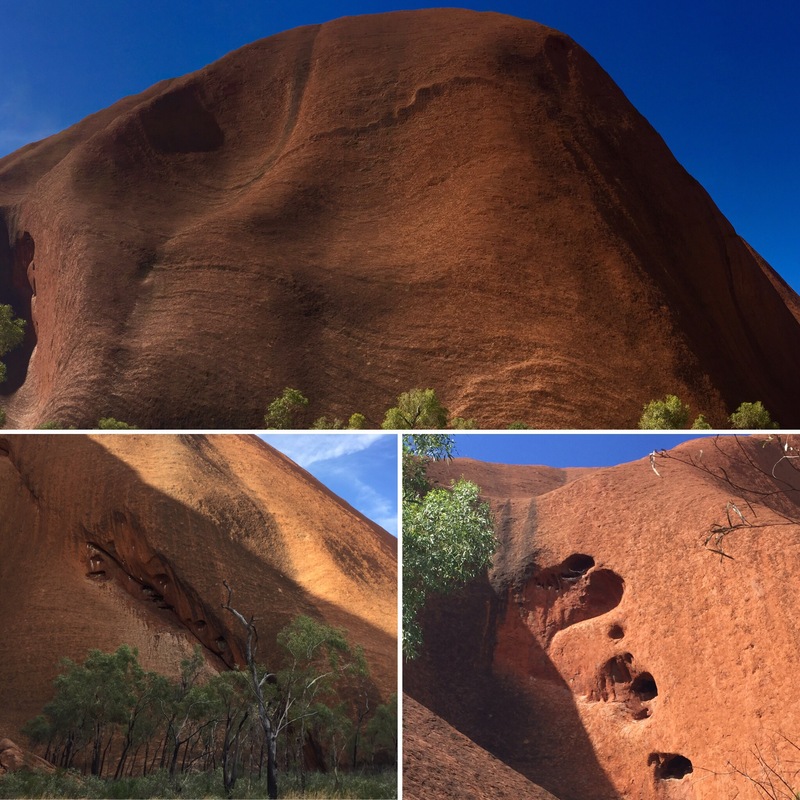 There are loads of red domes like at Kata Tjuta and the rocks are layered in many areas from millions of years of erosion. 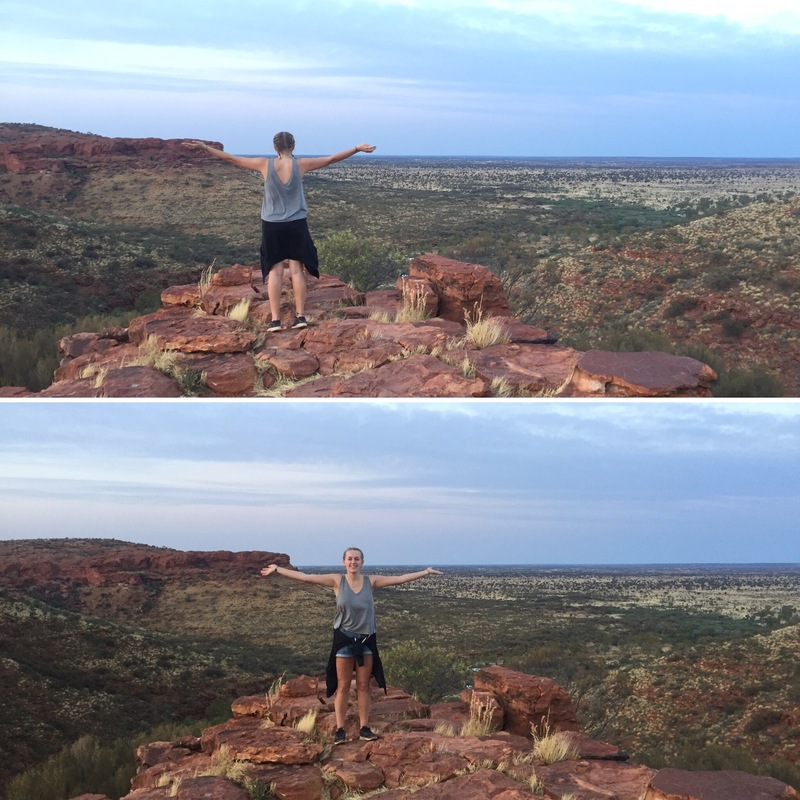 The canyon is really high and the views out across the outback are amazing – with the ground being so flat you can see for miles. I was surprised by the amount of greenery around the canyon and Mark talked to us a lot about the different types of plants which was interesting. 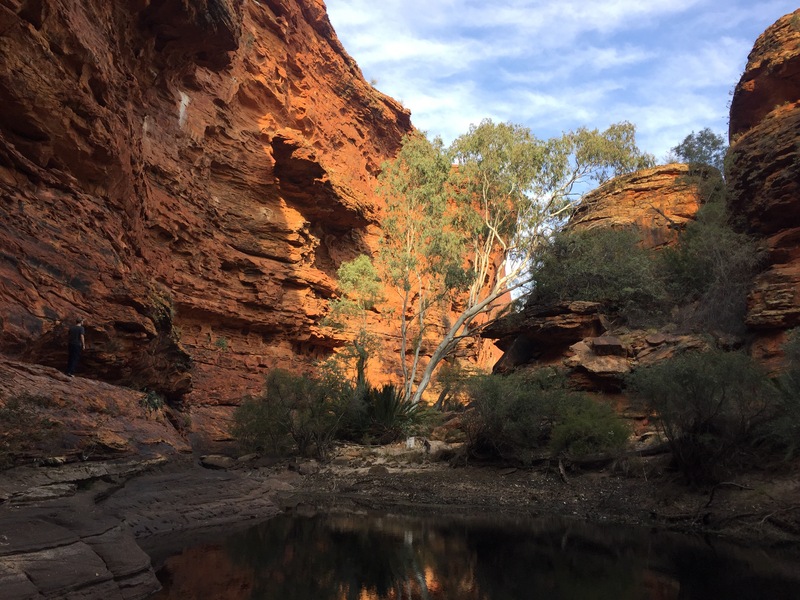 In the canyon there is a place called ‘the Garden of Eden’ which is a sacred watering hole to the aboriginals and the area down here is particularly dense with greenery as the plants have such easy access to the water. The place is so peaceful and we all just sat and enjoyed the quiet of the place for a while. 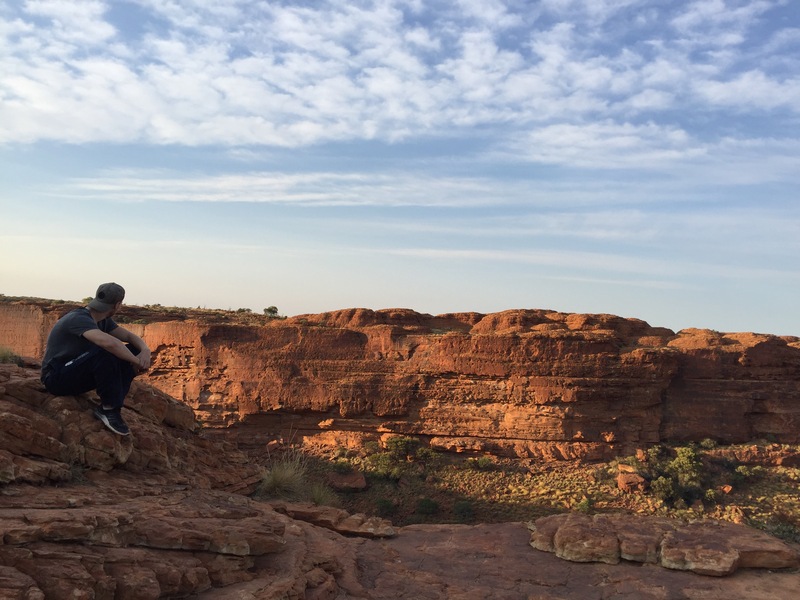 I think Kings Canyon was my favourite of the places we visited on the tour. It’s massive and I could have walked through all of the domes and looked out onto the amazing view all day. It felt like a different world and the lack of people helped make it even more peaceful and special. On our way back to Alice Springs, we stopped off at an aboriginal gallery. The artwork they had there was so beautiful and it was great to see what it was depicting. I bought a small piece of artwork from a lady called Katie. She had painted it herself and told me it was of four women sitting around a watering hole. There were a lot of bigger pieces which I would have loved to have bought if I had the money as they were all really good. 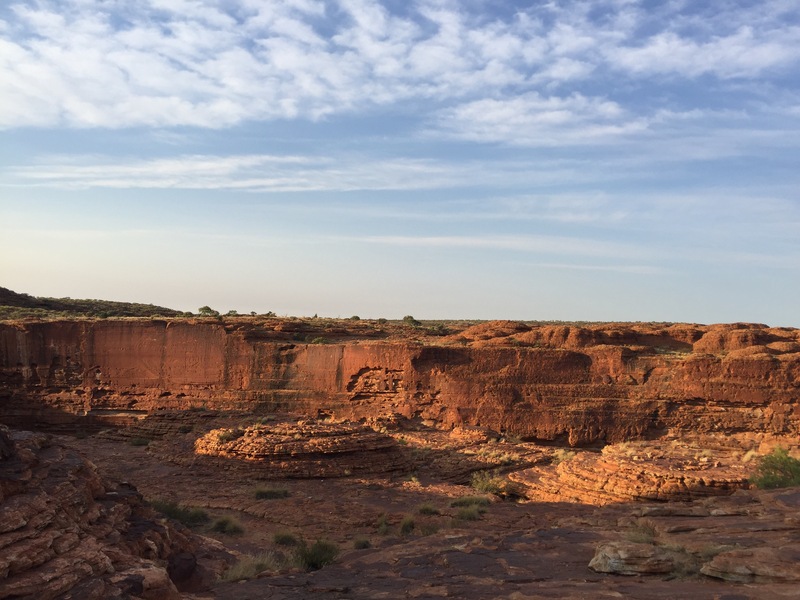 I would recommend visiting the Red Centre to anyone as I think it’s unlike anything else that Australia has to offer. 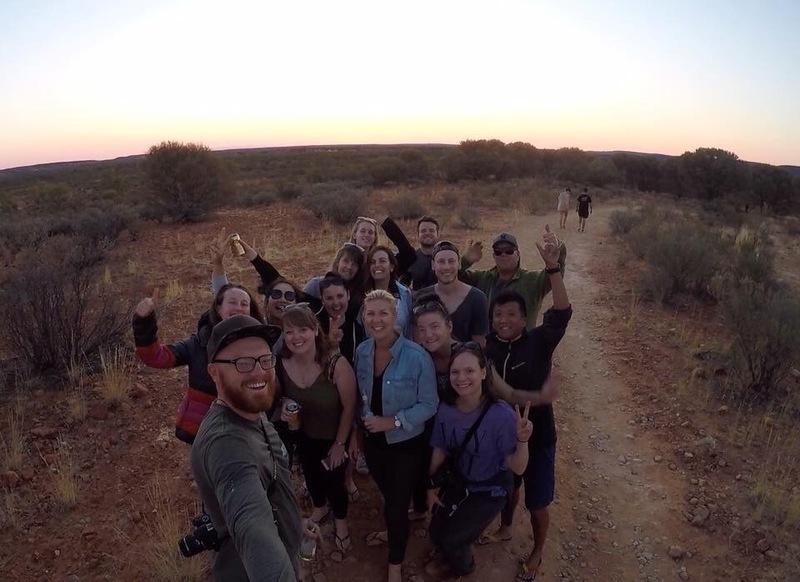 Although you could drive it, I think a tour is the best way to see everything as the distances are really far and the guides (well our guide with Mulga’s at least) knew loads about the area and the culture which meant we got so much more out of the places we visited. I think this now ranks as one of my favourite places in Australia and I am so happy we got to go and see it all!